PENSACOLA, FLA - Exercising at home is great ... except when prying eyes of family or neighbors happen to glimpse you in the middle of a sweaty workout. 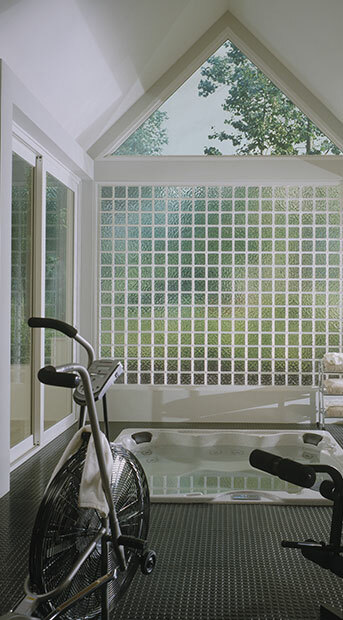 Protect your privacy by enclosing your home gym or workout room with stylish acrylic block walls and windows. "No one wants to feel closed in during a workout," says Roger Murphy, president of Hy-Lite, a U.S. Block Windows Company. "Acrylic block walls and windows allow in natural, energizing light but protects your privacy. The elegant seclusion afforded by obscure acrylic blocks gives you complete comfort in your home gym." Murphy points out that natural air flow can also be achieved in the workout space when using operable acrylic block awning windows. "These windows are hinged at the top and crank out from the bottom, so it's easy to let fresh air into the home without sacrificing privacy," says Murphy. "These awning windows come in a variety of sizes and can be created with tasteful Clear Wave, Glacier Wave, Cross Rib or Green Wave acrylic blocks." If having a privacy window is not an option in your home work out area, Murphy suggests adding a free-standing acrylic block wall system to partition off a secluded area in a large room within the house. "Acrylic block wall systems can be installed as room dividers, shower enclosures or interior accent pieces in the home," says Murphy. "It's easy to use these radius or straight walls to enclose a dedicated gym area to protect privacy while allowing you to enjoy a good workout."